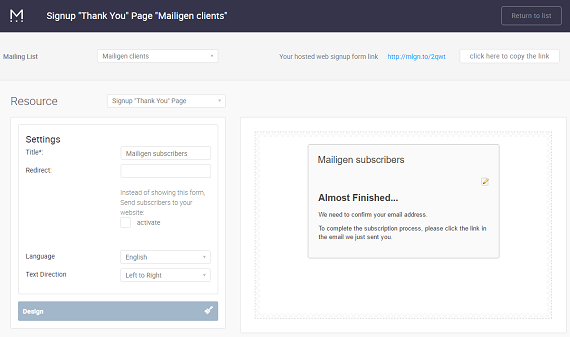 The Signup Thank You Page is displayed after users have subscribed to one of your lists. Next, select the Sign up “Thank You” Page from the Resources Drop Down. After you have selected the Sign up “Thank You” Page you can make changes to the behaviour or design of your page through the Resource Settings section or the Design Settings section. Note: If you have signup form embedded into Facebook, DO NOT use redirect option. It will not work on Facebook, unfortunately. 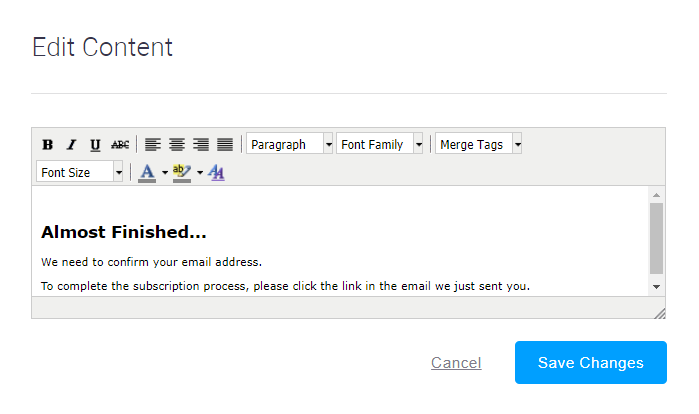 You can edit any of the text in the WYSIWYG panel of the “thank you” page by clicking on the Edit Icon. This will open the Edit Content window.